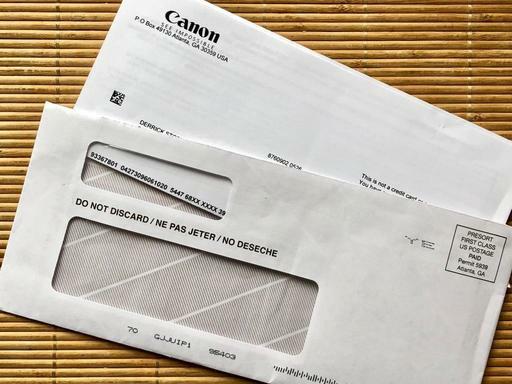 Canon Rebates - Do They Deliver? The short answer is: yes, but maybe not exactly the way you'd expect. When Canon offered a $250 "rebate" on its excellent PIXMA PRO-100 Wireless Professional Inkjet Photo Printer, I did not want to pass it up. My 13" Epson was DOA, and I needed a new output device. Problem was, I had experienced problems with Canon rebates in the past, and I was a little gun shy. I decided to give the program another chance. I meticulously prepared my rebate package by cutting out the UPC code, filling out all the little boxes on the rebate form, and including my sales receipt. I checked the envelope address twice to make sure that everything was in order. Then I sent it off on June 11, 2018. After a month, I hadn't heard anything and talked about the adventure on the TDS Photography Podcast. A few of my listeners suggested that I visit the Canon Rebate site and inquire about my submission. I used the chat function on their site and was instructed to send an email to canonrebates@acbcoop.com. I did that, and a couple days later I received a response stating that my rebate had been approved and that I would receive a card in the mail. And sure enough, on July 24, 2018, I did. 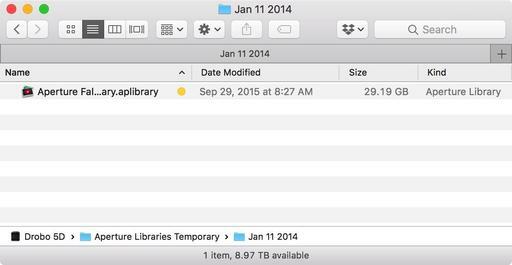 It took less than six weeks from start to finish. What I received was a Canon Mastercard Prepaid Card for $250. I had to activate it at MyPrepaidCenter.com, which was easy. And I was given the option to set up an account to track my card's activity, which I did. It's not really a rebate in terms of cash back. In fact, the two places you cannot use the card is at an ATM or gas station. But you can use it for a variety of purchases at most retailers. The expiration date is January, 2019. So, yes, I have my rebate in the form of a prepaid card that has an expiration date. Not ideal, but not terrible either. Looks like I'll be doing my part to keep the economy healthy by going shopping with my new Canon Mastercard. This is The Digital Story Podcast #645, July 24, 2018. Today's theme is "FOPS and the New Mirrorless Revolution" I'm Derrick Story. It makes total sense that the mirrorless revolution began without Canon and Nikon. On one level, that's what made it a revolution. FOPS - Fujifulm, Olympus, Panasonic, and later, Sony - previous underdogs, blazed the trail that many of us journey on today. But it was only a matter of time until the lords of the manor realized that they too must travel this road. And after a few notable detours, Canon and Nikon appear to be catching up. And when they do, the mirrorless revolution will enter phase two. But for reasons different than you might think. And that's our topic on today's TDS Photography Podcast. 2018 is a Photokina year, and the perfect stage for both Canon and Nikon to show off their full frame mirrorless cameras. Nikon has already begun to tease their release. And I'm sure that Canon isn't far behind. So what does this mean for mirrorless photography? For enthusiasts, I don't think much. Many Canon and Nikon ex-patriots have already found new homes. And I doubt most of them would ever go back. Pros who had previously dismissed mirrorless bodies, however, should be keenly interested in these new offerings. But don't expect Canon and Nikon to release anything truly innovative. That's not their gift to the community. Their machines will be powerful, robust, and feature excellent image quality. Something a pro can depend on. 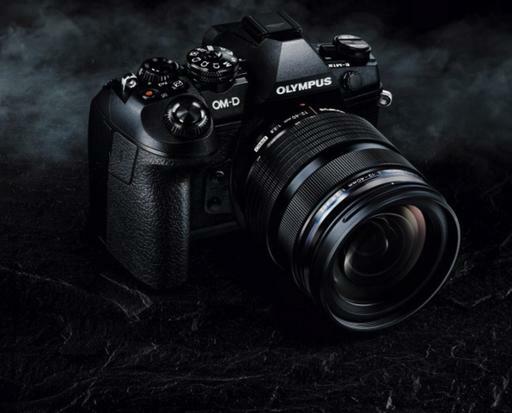 The real change will be led by FOPS (Fuji, Olympus, Panasonic, and Sony) and their response to the increased competition introduced by Canon and Nikon (Cankon). What might those changes look like? Here are 5 theories. More Artificial Intelligence - This actually fights the battle on two fronts: smartphones and Cankon. Seamless Smartphone Communication - We evolve from sending our images to our smartphones to just having them there. Lower Price Points - FOPS already has a bigger mirrorless community base, so they should be able to leverage those numbers to offer more affordable hardware. More Creative Modes - When you look at applications such as Luminar featuring alluring filters such as Image Radiance and Orton Effect, imagine if those filters were built into your camera? Innovative Body Design - Mirrorless brought back the retro look. But they have other design opportunities as well, especially MFT bodies that can use smaller form factors. Canon and Nikon re-entering the mirrorless space with quality products does not signal phase two of the mirrorless revolution in of itself. What they have already done with their saber rattling is to reenergize FOPS to take more risks and push their innovation envelope even further. And those four companies will lead the second wave of mirrorless. On the June 11, 2018 TDS Podcast I mentioned that "I'm Taking the Canon PIXMA PRO-100 Rebate Challenge" and had mailed in all the required documents for my $250 rebate. I just checked the mail today, July 23, and still no rebate in sight. Here's what did happen this week. "Good Afternoon, You claim was received and approved. Please allow 1-2 weeks for card to mail." I'll keep you posted. I had a nice surprise last week when the Sony Cyber-shot DSC-RX100 VI ($1,200) showed up at my door. It's a beautiful little camera with a 1" sensor and a 24-200mm zoom lens with a max aperture of f/2.8. I'm shooting with it now, and I'm hoping to have a report as early as next week. Stay tuned. I recently asked folks to post a review on iTunes if they were so inclined to freshen up our list. Big thanks to Murlach, flatmacsurf, JohnF from CT, Fastidious 1, and Brook Craven for chiming in. Each wrote informative comments that will be truly useful to potential listeners. Awesome! I like the clean look of a white backdrop. For certain portraits, such as this springtime flower shot, they just look right. "Christina with Flowers" - Photo by Derrick Story. Olympus OM-D E-M1 with Olympus 25mm f/1.2 prime lens. The problem is, as any photographer knows who has hung a white sheet and snapped a few frames, is that the camera really doesn't see it that way. And suddenly your clean white backdrop looks dull and dingy. I've tried all sorts of things, like bouncing lights directly off the background. But the system that finally gave me the results that I wanted turned out to be quite simple. I started with a thin, white commercial backdrop that works with my frame system. I then placed a diffused light behind the material, illuminating it like a light box. Then, all I had to do was concentrate on the exposure for the subject herself. If you're struggling with getting white backdrops looking bright and clean, consider this technique. It sure made my life easier. This is The Digital Story Podcast #644, July 17, 2018. Today's theme is "The Filter Box" I'm Derrick Story. I'm not one to hang on to unused items. If a camera or lens isn't seeing action, then I move it along to someone who will put it to use. I do have one exception to this rule: filters. I store them in a large shoebox at my studio. And they are the one photography accessory that I seldom part with. Why is that? I answer that question on today's TDS photography podcast. 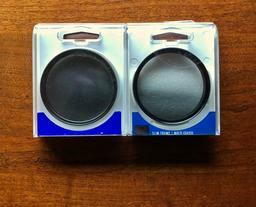 I remember when I bought my first brand new polarizer. It was a 55mm Contax circular model. It cost some godly amount of money, even for day that was decades ago. I was fine spending $300 for lens. But then to turn around and add another $100 for a filter? That seemed crazy. It was then, all those years ago, that I decided to protect and save my investment in filters. I knew that if I stuck to this approach, that it would save me thousands of dollars over my career. My photography is still going strong. And my filter investment is looking smarter than ever. Here are five reasons why. Filters are brand independent - Over the years, I've jumped from Contax, to Canon, to Pentax, Olympus, Samsung, Panasonic, and others. The lenses are tied to the camera brand. But the filters are not. I can use a Canon filter on a Pentax lens no problem. And I do it all the time. 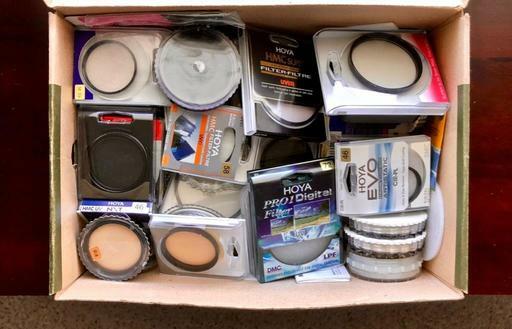 Filters cost a lot - Think about it: most filters are a cookie-cutter circle of optical glass, that's coated and usually mounted in a brass ring. Relative to the complexity of a camera lens, their price is way too high. Filters last a long time - I have filters that date back to the 1960s that still perform well. I've read that they lose their effectiveness over time. To some degree, maybe. But not so much that they compromise my work. The thing about filters is that there is not focusing mechanism, aperture blades, or f-stop ring to break. So unless you strip their threads, they function. Creative filters help shake up your photography - Whether it is a Zeiss Softar, Tiffen cinematic effects, or a rotating graduated filter - when I retrieve one from the box and pack it in my bag, fun just seems to follow. Filters provide a sense of security - I'm always a little over protective when I get a new lens. The first thing that I do is put a good filter on it before I hit the road. And I always feel more secure after doing so. Bickering over whether or not to use filters has been going on as long as photography itself. One thing that I do know is that quality, multicoated, filters have virtually no adverse impact on my images, and often provide some enhancement. Just like with lenses, get quality glass, and your investment will be rewarded. I'm back from my scouting trip for Burney Falls and Lassen Volcanic National Park workshop and I had an amazing time. Here's the recap. We have one seat open. This is the last opportunity to reserve before I go public next week. You're not going to want to miss this! I have 5 signed copies of the Apple Photos Book for Photographers, 2nd Edition, available. If you can post a review by August 15th, then send me your shipping info via the Contact Form on TheNimblePhotographer site. I'll get that book out to you right away. First come, first served. A welcome new feature in Luminar 2018 V. 1.3 Mac is compatibility with DxO's excellent FilmPack 5. 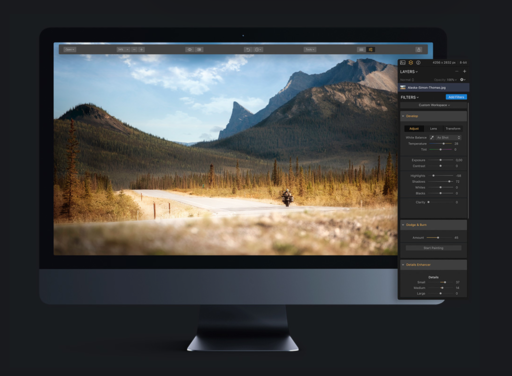 Luminar users now can integrate all of those great film looks into their workflow. No configuration is required. Simply open an image in Luminar, go to Plugins > Other > DxO FilmPack 5, and the handoff will automatically happen. 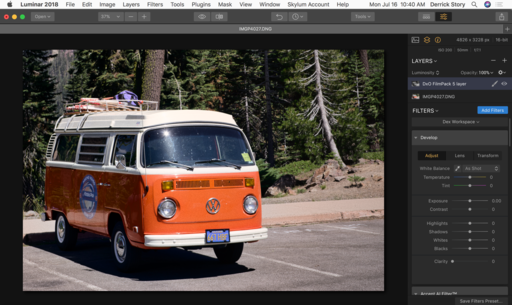 Once you've finished working on the picture in FilmPack, click the Save button in the upper left corner, and the edited image will be returned to Luminar as an adjustment layer. From that point, you can continue editing as you would with any project by applying blending modes, opacity adjustments, and of course, by tapping any of Luminar's Filters. DxO FilmPack 5 compatibility is just one of the new features in the Luminar 2018 V. 1.3 Mac update. You can view the Mac Release Notes here. Windows users also have a slew of updates. You can view the Windows Release Notes here. 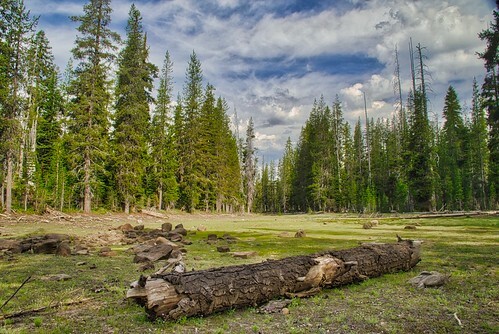 I spent the last few days on a scouting mission in Lassen Volcanic National Park. The primary goal of our mission was to find spots for an upcoming workshop, so we were moving quickly and exploring all times of day. To help tame the crazy light during this adventure, I used both a polarizing and rotating graduated filter on my Pentax KP DSLR with the super nimble Pentax HD DA 18-50mm zoom. A common approach among many photographers is to tap software in post production for their adjustments instead of using filters at capture. I do both. I think using a polarizer, neutral density, or graduated filter at capture allows me to gather more information in the file that I can manipulate more easily in post production. It's the old adage: good data in, good data out. "Meadow Near Juniper Lake" - Pentax KP, 18-50mm DA zoom, handheld, f/14, 1/50, ISO 800, +1 EV, polarizer and graduated filters. Photo by Derrick Story. One of the problems that I once had with stacking these filters was their density, causing me to lose 2-3 stops. This forced me to pull out the tripod, which would really slow things down on a scouting trip like this. But thanks to better high ISO performance with today's digital cameras, we can still stop down, handhold, and use filters. The above image is a RAW file recoded at ISO 800. I did not use any noise reduction in post, though I could have if needed. I'm sure by this point landscape photography purists are pulling what remains of their receding hairline out. I don't care. I am not competing with them. I am a storyteller who travels light and wants good images to accompany my words. So yes, I'm using a cropped sensor DSLR with a compact zoom and a couple filters. And I'm having a blast. 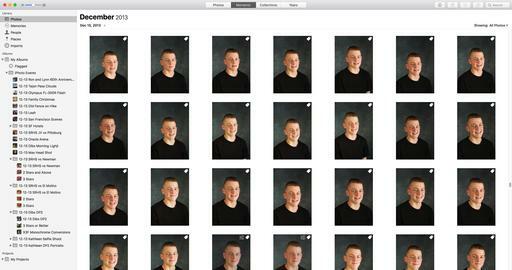 My point is, that we all have a lot of options at capture. How you take advantage of those tools impacts the time you spend in post. In the case of this trip, two simple filters helped me stay nimble, both in the field and at the computer. PS: If you're curious about an inexpensive graduated filter kit, take a look at the Bower 52mm Graduated Color Filter Kit to get your feet wet. 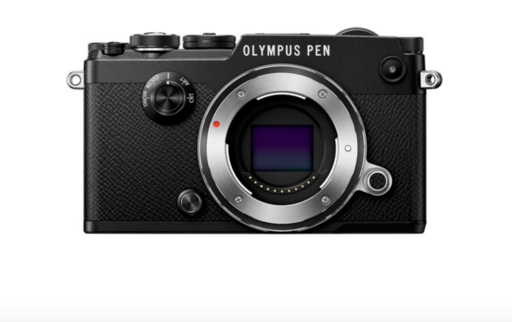 If you've been contemplating the timeless Olympus PEN-F mirrorless camera, it's on sale right now for $200 off the normal price: $999. What makes this even more tempting, the companion Digital ED 14-42mm f/3.5-5.6 EZ zoom is $100 off, only $199. 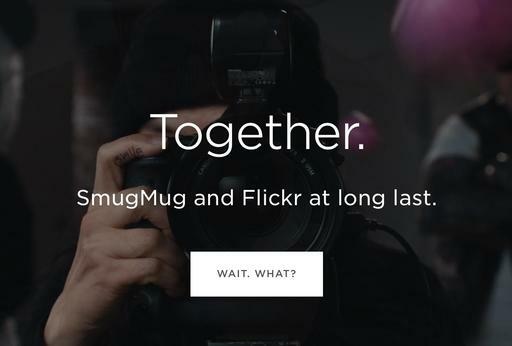 Together, they make an incredibly creative, compact, and powerful image-making tandem. And to top off the kit, I recommend the LC-37C Auto Open Lens Cap ($28) that automatically opens and closes when you power up/down the camera. It's super handy, and you'll never misplace your lens cap again. One other super nimble deal you might be interested in is the DJI Spark for $349. This is the quadcopter that I'll have stashed in my backpack as I scout locations for our upcoming Burney Falls/Lassen Volcanic Park Workshop coming up in late September.